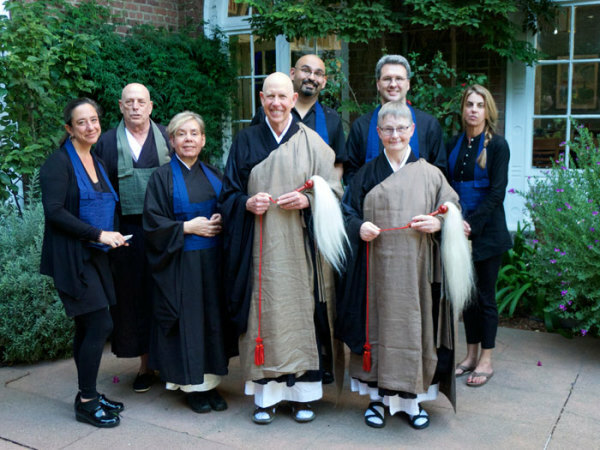 On Saturday, October 17, students of City Center Abbot Rinso Ed Sattizahn, Anshin Rosalie Curtis and Jamie Howell (Kogen Seido) were given the bodhisattva precepts in a lay ordination ceremony known as jukai. Congratulations, bodhisattvas! (L to R) Ann Marie Coletta, Jamie Howell, Annette Lorenzo, Ed Sattizahn, Miguel Rojas, Rob Walker, Rosalie Curtis, Lisa Pardini.